With a total of 8 medals, the success of the Slovenian team at the Sochi Winter Olympics was quite phenomenal; even more so when you consider the population of just 2 million people. I read some interesting statistics; in comparison, the USA, with 316 million people, would have needed to have won 1,106 medals to have equalled Slovenia’s success! Furthermore, there are only 148 registered ice-hockey players in Slovenia but the team made it through to the quarter finals, ranking them among the best 8 hockey teams in the world. Something for all Slovenes to be proud of and the rapturous receptions the competitors have been receiving on their homecoming, certain bears testament to that. 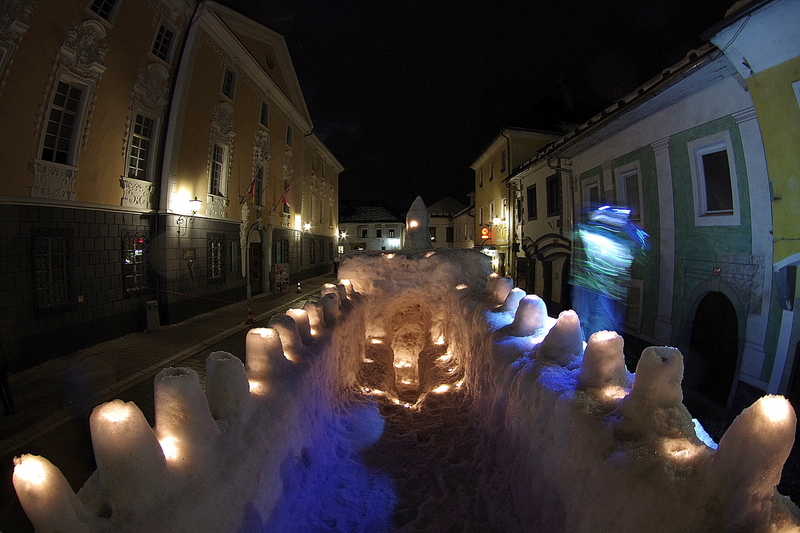 The snow in Radovljica was put to good use last week when, for the second year in succession, a snow castle was built in the old town centre. 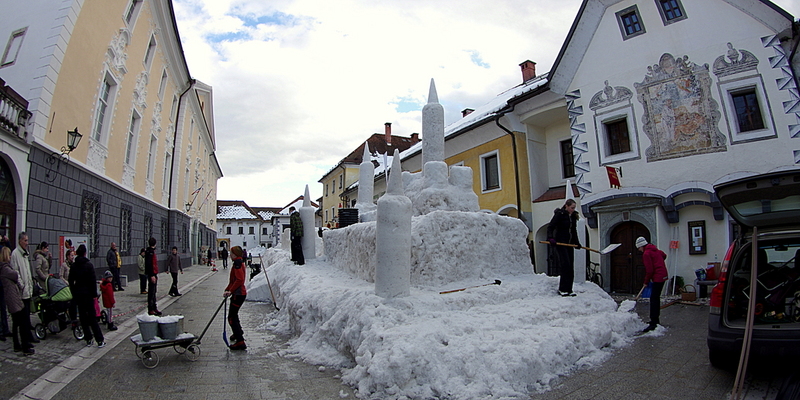 Locals were invited to come along and help build the castle so it really was a ‘team-town’ effort. Just take a look at these photos, more of which of these and others can be seen on my Pinterest page (http://www.pinterest.com/adeleinslovenia/), to see the results of the work, which was especially impressive when illuminated at night, thanks to the teams at ‘Playful Architecture’ and the ‘Centre for Architecture Slovenia’. Sunday, the last day of the winter school holidays, at least for those in the west of Slovenia, finally saw the brilliant sunshine that had been lacking all week and it seemed like half the land, if not more, took to the roads, ski pistes, hills and mountains to partake in winter sporting activities. 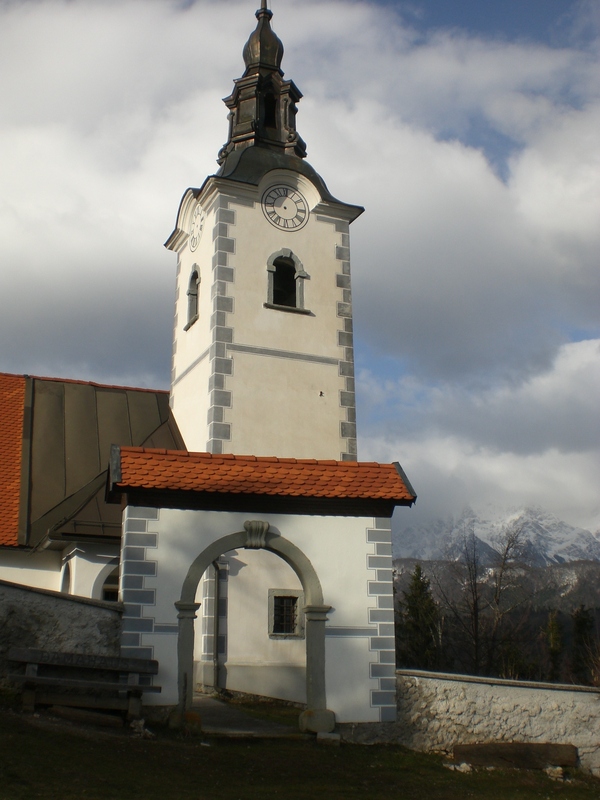 The ski centres were doing a roaring trade and the roads to/from the main resorts, such as Bled, Pokljuka, Bohinj and Kranjska Gora, were thronging as if it were the height of the summer season. I made the most of the day with a double-whammy of outdoor activities. My day started with an early morning walk to Valvasor (which I wrote about in last week’s blog) then, after some sustenance and a short rest, an afternoon walk to Štefanja Gora, home to the Church of St. Štefan. This hill (748m), is in an idyliic location above Cerklje na Gorenjskem and beneath the Krvavec ski resort. Although not high, there are wonderful and expansive views, to the south across the valley and to the north towards the Karavanke mountains. Just a few minutes beneath the church is the small tourist farm, Pr’Mežnarju, which offers refreshments and the winter sun meant it was even warm enough to sit outside with a nice cuppa! Preparations for this year’s traditional Shrovetide carnival ‘pust‘ continue with people busy planning, sewing and creating their fancy dress costumes. 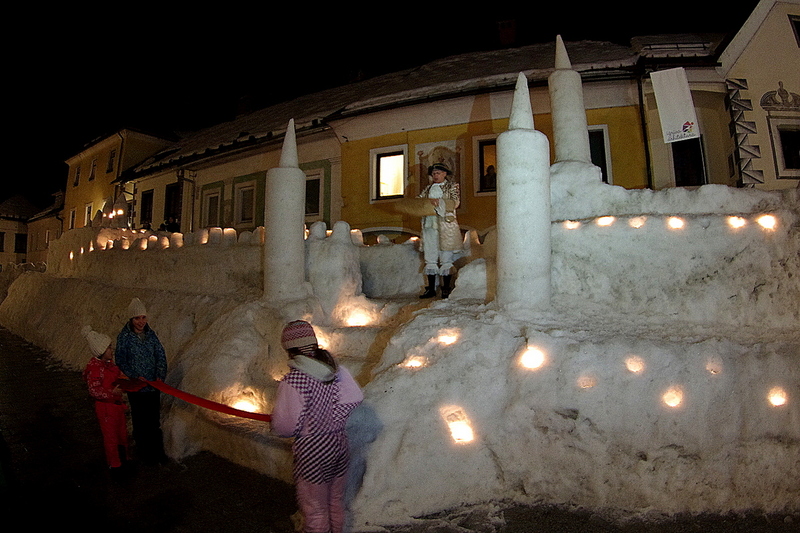 The street parade will take place on Saturday 1st March when Radovljica will be awash with a procession of witches, clowns, animals of every description and a riot of other original costumes. If you want to see it be sure to arrive early, as the surrounding streets are closed to traffic just before, and during, the parade, which will start at 2pm and travel through the centre of Radovljica ending in the old town centre at Linhart Square. Hope to see you there, though you might not recognise me!!! 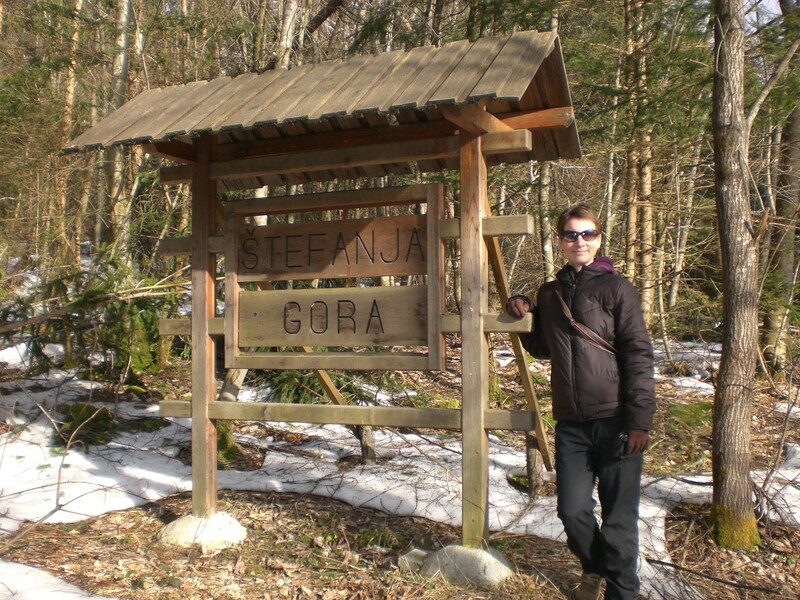 « Seven Years in Slovenia!